I arrived in California (to attend my friend and food blogger Gastronomer's wedding!!) tired and famished. With the 3 hour time difference, I ate a bit and went to bed. In the morning, I was needing some serious coffee. 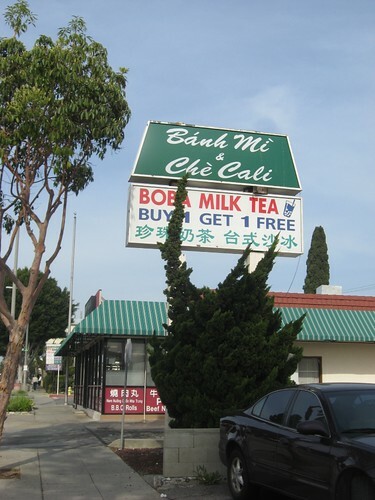 Luckily, my uncle lives near Bánh Mì Chè Cali, and we went by to pick up a cà phê sữa đá (Vietnamese ice coffee sweetened with condensed milk). This place was packed on a Saturday morning! 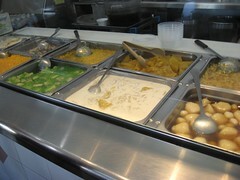 Waiting in line to order, I spotted all sorts of treats and not just bánh mì (Vietnamese subs). If you've ordered any drinks, you pick up on the other side of the counter, where you can also find the chè (Vietnamese dessert) counter. While you can order for take-out, there are also tables to eat in. I could hear Vietnamese and Cantonese patrons, leading me to believe the owners may be of Chinese Vietnamese descent. 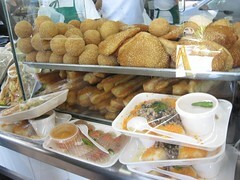 From top, clockwise: waiting in line to order, different take-out treats, the different chè offering and freshly made bánh cuốn. 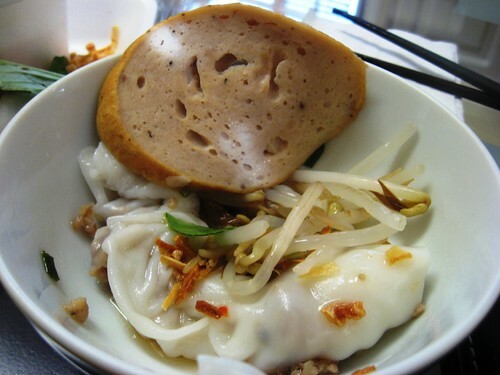 Along with my coffee, I grabbed a package of freshly made bánh cuốn (steamed flour sheets with ground pork) and another of nem nướng cuốn (grilled ground pork rolls) The bánh cuốn was pretty good considering it was coming from a "fast food" place, not specializing in one specific dish. The package came with all the necessary toppings including cooked bean sprouts and fresh Thai basil leaves. The nem nướng cuốn was rather disappointing, with bland vegetables (iceberg!) and bland pork patties. Much better nem nướng cuốn coming up later on my trip. 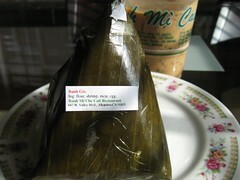 On another morning, I decided I could really go for bánh giò (Vietnamese steamed dumpling) and grabbed a triangular shaped banana leaf package. 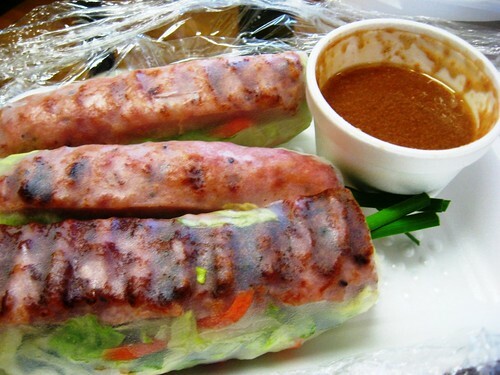 Unfortunately, it was not bánh giò. 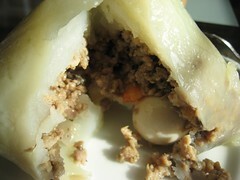 I got it right the next time when I actually read the package and grabbed a still warm and very large bánh giò. The filling had some extra ingredients like a shrimp and a quail egg. It was pretty good and satisfied my craving! 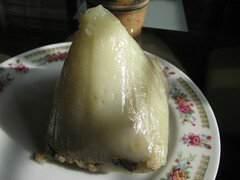 Bánh giò in three states. Back to my first day in California, my cousin K, her husband and two year old came by to visit. She thought I should try the popular Boba drink (which I think is referred as bubble tea at home). 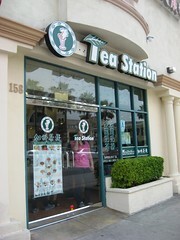 My drink was passion fruit and green tea; the fruit flavour was just what I was expecting. 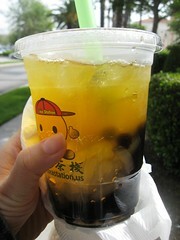 The "boba" - tapioca balls - themselves, I could go without. I liked the jelly better but would be just happy with the drink on its own. My passion fruit and green tea Boba. This was just the beginning of a very filling trip to California! Oh I love OC!! Was just there for Lunar New Year and my god, the food was awesome even at those fast food places!